On a cold rainy night, there’s nothing better than sitting by a fire with your trusty acoustic guitar. You probably have a few songs that you automatically go to when you pick up the guitar, but if you’re on the lookout for some more great acoustic guitar songs, look no further than GuitarControl.com. 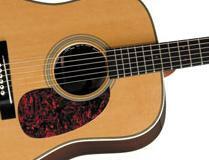 Here’s our short list of some of the best songs to play on your acoustic guitar. Jimi Hendrix’s electric rendition of this song is a classic, but Bob Dylan’s original is a relatively simple acoustic arrangement. If you know how to play the harmonica (or you have a friend who plays one), this could be a great opportunity to add a little bit more flavor to this classic song. Dylan’s “All Along the Watchtower” is a great acoustic guitar song for anybody who is trying to get into folk music. “Yesterday” is one of the greatest Beatles songs in the band’s catalogue, and though their original recording of the song is quite sprawling and features a great violin melody, you can pull this song off with just an acoustic guitar. This song is great for guitar players who love fingerpicking and learning new patterns. The vocal melody might be a little challenging, though, so if you’re struggling, slap a capo on the neck and change the key to one that works for you. Bob Dylan makes another appearance on the list with the classic “Tangled Up in Blue.” This gem is one of the best songs on Dylan’s classic album Blood on the Tracks. Jerry Garcia, memorably, covered this song on a few different recordings, but it’s nice to go back and listen to Dylan’s simple arrangement. This is a great acoustic guitar song because of its simple structure and fun chord progression. It can be a little tricky for beginners, but it’s an absolute classic that can be really rewarding. As with most Dylan tunes, good luck remembering all the lyrics, though. Pink Floyd’s catalogue is a sprawling (and sometimes messy) display of some of the best of folk and psychedelic rock, and “Wish You Were Here” from the album of the same name is no exception. This song is often featured in beginner songbooks, but it can be as complicated as you want to make it. Gilmour’s quick little licks add a lot to this simple chord progression, and if you take your time and learn them (and maybe even write a few of your own), you can take this song from a beginner’s acoustic course to the big leagues. There you have it: four of the best acoustic guitar songs. There are many more great acoustic tunes that we had to leave out, but if you take a look through our website, you’ll find tons more posts and lessons on other great acoustic and electric guitar classics.